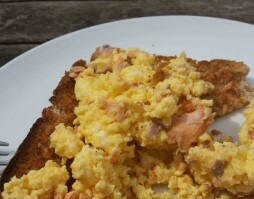 Have you ever tried adding salmon to scrambled eggs for special occasions and enjoyed it? If so, now’s the time to switch to Goatsbridge BBQ Smoked Trout and make it a weekend treat instead! The flavours of our fish combine beautifully with the soft scrambled eggs and will give you a protein packed, energising start to any day. Break the eggs into a saucepan and add the milk, whisking constantly using a kitchen fork or small balloon whisk. Continue to cook over a medium heat, stirring all the time until the mixture comes together, or ‘scrambles’. Remove from the heat before the mixture sets too hard as it will continue cooking off the heat for a minute or two. Remove the BBQ smoked Goatsbridge rainbow trout from the sealed packet and shred with a fork. Add the smoked trout to the scrambled egg mixture, mixing together. Freshly grind some salt and peppercorns on top. Serve on freshly toasted bread. If you liked this easy BBQ Smoked Rainbow Trout recipe you can buy our Rainbow Trout in all good Irish supermarkets, including Supervalu and Dunnes Stores as well as specialist shops around the country or from our online shop .